"Home Comfort" is hard to find in the U.S., but second-hand copies are available through Amazon.com. I was able to check it out through my local library, and do not own my own copy. The book is primarily concerned with the facilities for, and duties of, servants in British great homes, from Elizabethan times forward. Apart from the generally interested reader, it provides a very useful reference for writers wanting to check details of life (upstairs or down) in such homes. Information on provisioning, storage of food, the house farm, dovecotes, poultry yards, fish ponds, etc., as well as the making of butter and cheese, ale, bread, spirits…all of these were originally done in house in large households. Eventually, such work was “contracted out” to businesses in town. A lot of terminology we still use comes from old processes. “Larder,” for example, as a cool room for storing food, came from the practice of potting joints of meat in large barrels or tubs covered with lard. Self-igniting matches (“lucifers”) weren’t invented until 1831. Before then, it was necessary to keep a kitchen tinder box filled with flammable materials, to be lit by striking a flint against a steel. A “match” (tipped with brimstone, or sulfur) was used to transfer flame to the kitchen fire. Alternatively, embers could be kept glowing under a metal dome: “couvre-few” = curfew. Spit-roasted meats were popular, and in some large houses, the spits were turned by dogs running in a wheel (just like a large hamster wheel). These seemed to have been in use from at least the mid-16th century into the 18th century. “Built-in charcoal ranges were a feature of eighteenth-century kitchens” – but it’s less clear to me if these would have been limited to homes of the wealthy, or when they would have come into more common usage. “The first patent to combine a kitchen grate with an iron oven was applied for by Thomas Robinson, a London ironmonger, in 1780.” The design, combining an open fire, oven and hot water boiler, was quickly improved and spread rapidly in coal mining areas and in cities (where coal could presumably be delivered). Though in large homes, old-styled wood ovens were still considered preferable for baking. Gas began to replace solid fuel for cooking in the 1890s. Electric cookers were developed around the same time, but were slower to catch on—not really becoming popular until the 1920s when electricity networks spread across the country (the UK in this case, I don't know if the same dates would apply to homes in the U.S.). Rushlights were the simplest and cheapest form of candle—consisting simply of a peeled rush dipped in fat. Tallow candles were a step up, and made by repeatedly dipping cotton wicks into pots of melted fat, gradually building up the layers. This was a smelly and unpleasant job usually done by/or at a chandlers, rather than in each home. Molded candles used a better quality of fat and gave better light with less smoke and spluttering. Beeswax or spermaceti candles were far superior, but also much more expensive. Paraffin (hydrocarbon wax) candles were first marketed in 1857, and were in general use by 1900. Oil lamps were known since ancient times, and could burn animal or vegetable oils. Improved designs incorporating a reservoir and chimney were not available until 1784. Whale oil was gradually replaced by mineral oil (kerosene) following its discovery in 1859. Experiments with gas lighting began as early as 1780. The incandescent gas mantle (a hood made of knitted cotton impregnated with thorium and cerium) was invented in the 1880s. Early electric carbon lights were suitable for light houses as early as 1858, but not for home use. Thomas Edison’s carbon filament incandescent light bulb was invented in 1878. Early sources of heat were, of course, the burning of wood, charcoal, and, in some areas, peat or turf. Charcoal “has been made and burnt in Europe for at least 5,500 years." While the Romans had mined surface deposits of mineral coal for use in their hypocausts, after their departure from Britain, coal seems to have dropped out of use until the 12th century. “Sea coal” was the term used for mineral coal, because it was usually transported by sea -- as opposed to charcoal, which was typically just called coal. By the early 17th century, depletion of timber led to increases in the use of (mineral) coal. Innovations in fireplace and flue design are discussed, but the book does not mention the Franklin stove. Perhaps these were never popular in Britain, even though I believe Franklin was living there when he invented it. A preference for open fires over closed stoves, gas fires, or central heat lasted through most of the 19th century. Early sanitary arrangements sometimes used flowing water or reservoirs of sifted dirt to “flush” away waste. The earliest description of an individual cistern to be used for flushing was by Sir John Harington, godson of Elizabeth I, in 1596. Even great houses varied in how much this type of arrangement was used—some had a convenience in every bedchamber, others preferred to rely largely on separate outhouses. The valve water closet was patented in 1775. This design introduced the famous (and necessary) S-bend in the pipe, which remains filled with water, keeping out the stink. It’s not clear, however, when these arrangements were introduced and became commonplace in more modest homes. Laundry was also a complex chore. Whenever possible it was desirable to dry clothes and linen outside, and large homes might have a special walled drying green near the house (to deter thieves). Hedges of rosemary and lavender were grown for the purpose of having clothes laid over them to be dried and scented – a lovely idea I'd like to revive! Have you read the novels that inspired "Penny Dreadful"? So far, I've only seen the first episode of the new Showtime series, "Penny Dreadful;" a great romp through classic horror. The blog, "Kindle Nation Daily," has links to Kindle versions of "Frankenstein," "Dracula," "The Picture of Dorian Gray," and the Allan Quartermain series. Their links are to Amazon Kindle versions, which are priced at .99 cents to $1.99. Or I'm sure you can find of all of these (for free) at your local library, and probably through Project Gutenburg. I've read (and own) all the others, but I want to check out Allan Quartermain. "Killed The Mockingbird? American Classics Cut From British Reading List"
British Education Secretary Michael Gove has decided that the English literature list for a national exam needs to be more English, so he is swapping American texts in the curriculum for British ones. The new books have not yet been announced, but Gove's changes have prompted an outcry. From TTBook.org, more on how we learn empathy from fiction, this time broadened from literature to include film -- though TV did not have the same effect, at least among preschoolers. Also on TTBook.org, author Lorrie Moore talks about TV as literature, with links to her essays on "The Wire," "Friday Night Lights," and "Homeland" (only the Homeland essay is freely available to non-subscribers to the New York Review of Books). As a reader, I used to be a serial monogamist. If I started a book, I stuck with it and didn't start reading anything else until I finished it. Now I typically have four or five books going at the same time. Maybe it's because I don't concentrate as well as I used to, and I get more read by swapping around. Maybe it's just because I have many different book-delivery devices, and I feel compelled to use all of them. When I started adding up all the books I'm reading at the moment, I scared myself a little. 1. One of my current projects is re-reading all my books on writing. I like to read a chapter as kind of a warm up to working on my "morning pages" (if you don't know the term, think journal). I don't manage every day; sometimes weeks go by. But when I can find some time to linger over my morning coffee, that's what I like to do to help organize my brain. I've just started working my way through Ursula LeGuin's book, "Steering the Craft." She has such amazing skill with the English language. Once again I am awestruck when she shows how a conceptually small change in verb tense or POV changes everything about a passage. 2. I always have an audiobook going, mostly for when I'm driving. Listening to a good story helps me overlook the stupidity of everyone else on the road. I'm entertained, so I can be patient and gracious. At the moment, I'm listening to "The Plantagenets" by Dan Jones. It's a recent book and as part of my Plantagenets project makes an interesting comparison to Thomas B. Costain's series. 3. On my nightstand, I like to have a book going that is enjoyable, but not too demanding to follow as I'm getting ready to go to sleep. My current nightstand book is an old favorite: "The House on the Strand," by Daphne DuMarier. Set in Cornwall, features time travel in the form of a mind-bending drug, and told by an unreliable narrator – a checklist of things I like in a book I'm reading for entertainment. Not to mention that the time travel is back to the Plantagenet era, and so fits with my current reading theme too. 4. On my Kindle, I'm working on "Vampires in the Lemon Grove," by Karen Russell. I tend to throw my Kindle in my purse when I'm going somewhere I know I'll probably have time to kill – commuting on BART, a doctor's office, or the hairdresser's. A volume of short stories is perfect, because I can finish one and pick up another at a later date without losing the thread of a novel. 5. On my other Kindle, a Fire HD, I mostly keep books with pictures to take advantage of the color capabilities. Travel books and cook books live there. I'm also slowly slogging my way through Anne Somerset's biography of Britain's Queen Anne. While I'm interested in learning more about the period, sadly Anne herself comes across as having been rather tedious and peevish. 6. Last but not least, I have both Kindle and Nook apps on my phone. I usually have something downloaded there so I don't panic if I get caught out somewhere with nothing to read. I'm just starting "Rabid," Bill Wasik and Monica Murphy's book about the cultural history of rabies. How about you? Done a "currently reading" inventory lately? Thomas B. Costain's four-volume series on the history of the Plantagenents was first copyrighted in the late 1940's and early 1950's (depending on the specific volume). So, they had already been around for quite some time when I first read them the summer I turned 14. That was the summer of the first moon landing, as well as the Manson murders. I've read all four books several times since, though not for a number of years. I've hung onto to them all this time, and have no plans to part with them anytime soon. It might seem like an odd reading choice for a teenage girl, but I'd been to Europe a few years previously with my parents and fell in love with English history. There's nothing like castles and cathedrals (except maybe outer space) to capture the imagination. So, given that there was a band of people (still unknown and uncaught at the time) in the vicinity who were breaking into people's homes and slaughtering them while they slept, avoiding the current reality by mentally hiding out in the Middle Ages seemed like a plan. I had not read history books like these before – as opposed to historical fiction. Costain's narrative made real long-dead figures round up off the pages and come alive. Eleanor of Aquitaine, bad King John, and the Princes in the Tower: real people, real passions and real mysteries. I'm sure the author took some liberties with interpreting the records as pertaining to personalities, but from what I can tell his scholarship seems to hold up well in comparison to more recent books on the same period. Watching "The Hollow Crown" made me want to learn more about Richard II in particular, and I thought immediately of re-reading these books. Alas, my old, 75 cent paperbacks are yellowed and coming loose from their bindings, so I thought maybe I'd buy myself a new set. It turned out that the most cost-effective way to re-"read" them was to use my audible subscription to pick up the audio versions. I enjoyed them just as much as previous reads, as read with the classical English accent of narrator David Case. Only raised an eyebrow a couple of times at comments on more modern times that must have seemed apt at the time they were written. I've followed the re-read of this set with other reads (or listens) and rereads covering, or set in, the same general period. I'm currently finishing the recent, "The Plantagenets" by Dan Jones, and recently listened to "A Burnable Book" by Bruce Holsinger – and I plan to write a little more about these soon. Lifehacker has a good discussion going today on the "Best Book Recommendation Service." So far the suggestions include a number of services I didn't know about, as well as options I did -- such as Goodreads and Library Thing. Got me thinking about all the ways I usually find new books. I do use both of the above. I also follow NPR's Book feed, and listen to interviews with authors on the radio. Sometimes our area newspaper has intriguing reviews. Sometimes I'll check out the details on books suggested by Amazon's algorithm -- or Audible's recommendations for audiobooks. Mostly I search for books on topics I've become interested in -- either because I've visited somewhere and want to learn more about it, or I saw a film or TV show that made me want to look deeper. Or I might be doing background reading for research or inspiration on a writing idea. One of the things I love about Kindle is that you can usually download a sample chapter. I download a lot of sample chapters, and use them as kind of a "to read" list. If I like something, I hang on to the sample and buy it or check it out of the library when I'm ready to read. My favorite way to find new books is browsing in the book/gift stores at museums. That's where I've picked up books I don't think I would have known about otherwise. And last but not least, these days I'm finding all kinds of things in the course of trying to tidy up and catalog my own out-of-control book collection. Some I didn't know I had and can't remember reading, others I'm looking forward to revisiting. Apps for Readers: Catalog Your Library and More! A couple of months ago I decided to take on the project of cataloging my personal library. No mean feat, as my home is overflowing with real paper books. I also have a large digital collection of ebooks and audiobooks -- I have some of my favorites in multiple formats. In searching around for information and reviews of apps and programs to help with this task, I ran across this video by an enthusiastic book blogger, "YA bookworm blogger." She has a lot of great suggestions for reading and book apps. In particular, I picked up "Bookwatch" for my iPhone. Bookwatch lets you enter your favorite authors, and then keeps track of new releases by those authors as they come out. My catalog project is probably going to take me years, especially as I keep stopping to reread old-favorites (or at least dust them) as I go. But at least I have the right tools to make it easy! 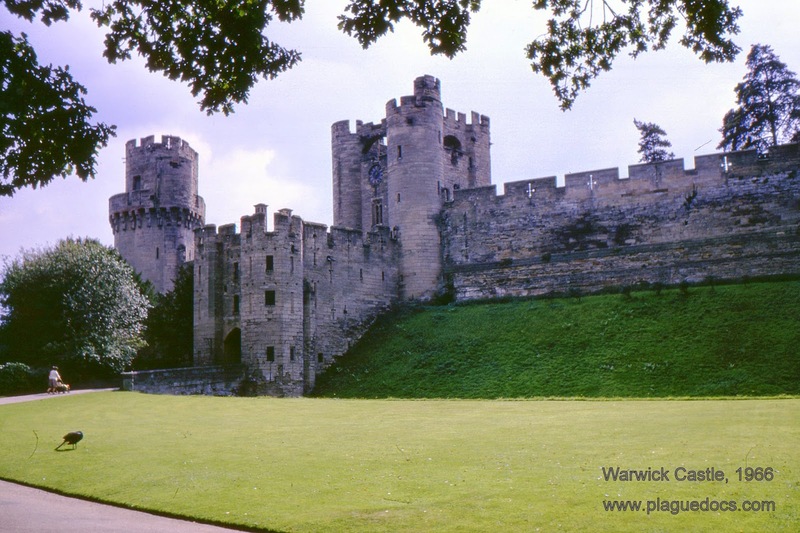 Which is not a book, of course, but a TV presentation of Shakespeare's four history plays: Richard II; Henry IV, Part 1; Henry IV, Part 2; and Henry V. Filmed on locations including Gloucester Cathedral and Pembroke Castle, and beautifully acted by a cast led by Jeremy Irons as Henry IV. Then imitate the action of the tiger. . . ."
King Henry V's "Saint Crispin's Day" speech – so familiar that, of course, it must have been what he actually said before the battle of Agincourt (Henry V, Act 4, scene 3). Shakespeare's language – and version of history – so permeates our culture, that a new book (discussed in the TTBOOK segment on fiction linked in the previous post) claims "Shakespeare is the most important figure in history who influenced everything from starlings to the assassination of Abraham Lincoln." The book is called, "How Shakespeare Changed Everything," by Stephen Marche. I haven't read it yet, but it sounded like it might be a fun (if rather ADHD) read. For me, watching the plays revived an old interest in the period. And so I started on a binge of reading and rereading (and watching!) all the fiction and non-fiction I could find pertaining to the Plantagenets. Does Fiction Make Us Good? "To the Best of Our Knowledge" had an interesting discussion on this topic the other evening. It seems that reading fiction does contribute to "Theory of Mind" and may help promote empathy.